When you think of the Netherlands, most likely Amsterdam will come to mind, but you probably aren’t too familiar with any other Dutch cities. At least I wasn’t until I learned about the city of Rotterdam. I had the chance to visit recently, and I was greatly surprised. Shhh don’t tell Amsterdam, but I think I even liked it more then the capital itself. 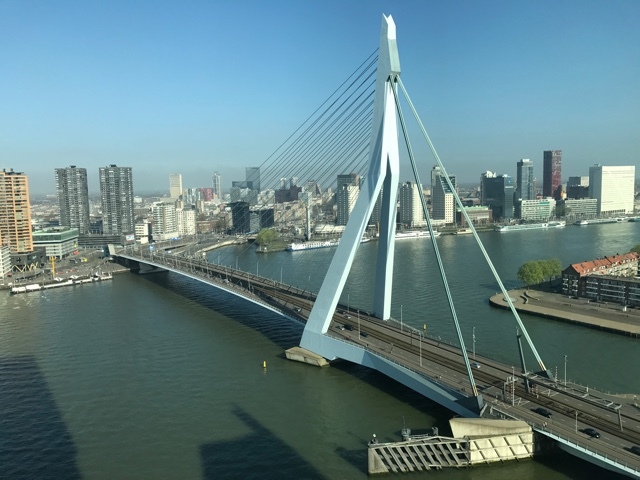 Located a little less than an hour by train from Amsterdam, Rotterdam is a great place to visit for the day. But if I were you I would spend at least a couple nights. Filled with delicious food, unique architecture, great art, history and more it has it all. Since it is a bit less unknown, it is also a lot less touristy then Amsterdam, which is a huge bonus. 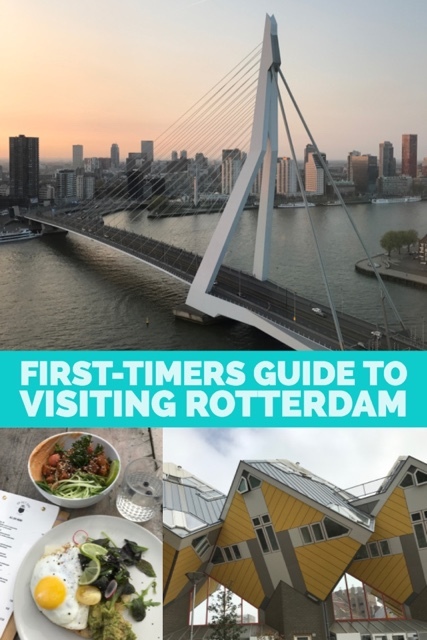 I really loved visiting and I think my suggestions below will be a great first-timers guide for visiting Rotterdam. Hopefully you can string these experiences together in a way that makes the most of your first visit. One of the most important parts of travel for me is finding and experiencing delicious food around the world. Local to the culture or not, if it’s good, I want it. 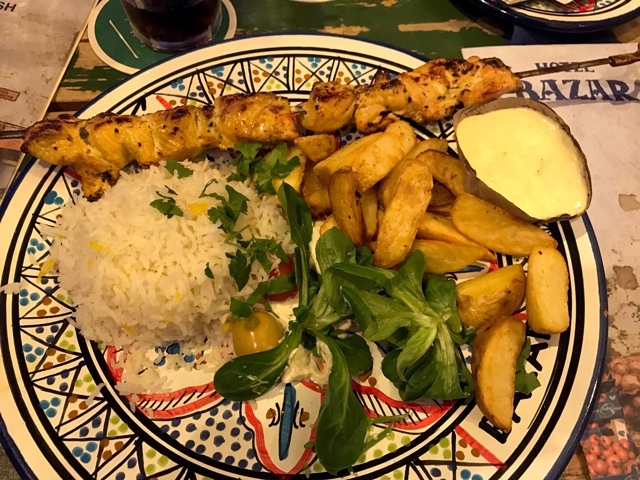 Rotterdam is quite the multicultural city and this is really reflected in it’s delicious dining options. Here is a sampling of what the city has to offer from what I was able to enjoy personally. Op Het Dak is a roof top cafe overlooking parts of the city. 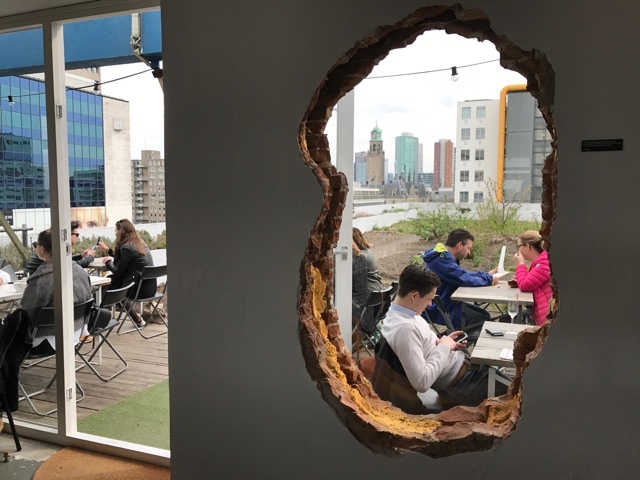 This cafe has a funky vibe not only because of the purposeful hole in the wall but also because it overlooks its own rooftop farm/garden. This also happens to be the largest urban rooftop farm in Europe. 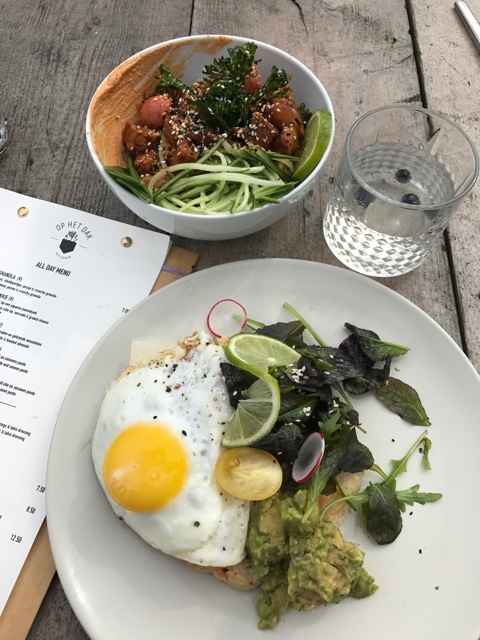 If you are lucky enough you might find some of the rooftops very own produce on your plate or find it served at other local restaurants nearby. Bazar is centrally located as I always found myself walking past it while exploring the city. Not only is it a restaurant serving North African and Middle Eastern food but it also a hotel. The restaurant covers 2-3 floors and is packed with people everywhere you look. The decor and food combined transport you and your tastebuds happily to another destination. This restaurant is great for going to by yourself but could be even better with a group of friends and tons of food to share. While at Bazar I definitely ordered too much food. Aside from the kebab plate I also had the hummus, calamari and finished it off with a tasty chocolate cake and tea. 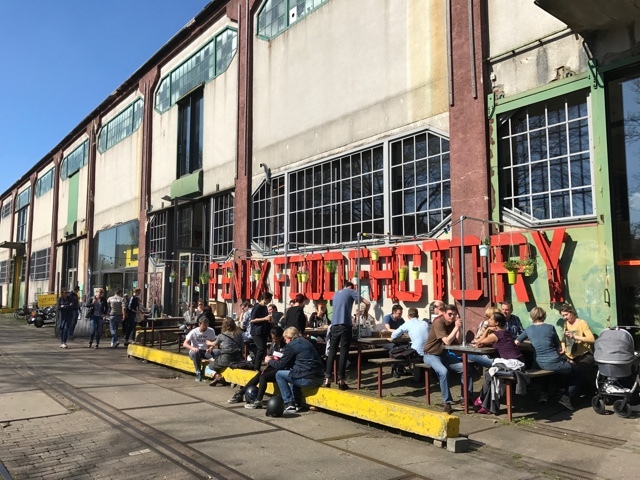 The Fenix Food Factory is a cool food market put together by seven local entrepreneurs in an old warehouse. It is the kind of place that is full of locals and if you don’t “read” Dutch it might be intimidating. But don’t worry, mostly everyone speaks English and we all know the universal language of pointing at things that look good. 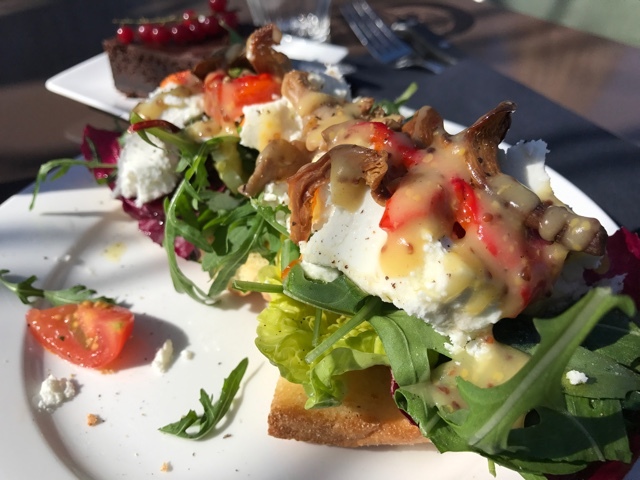 While there I ate outside at the POSSE Rotterdam Restaurant Gallery and had the most delicious open faced goat cheese sandwich. I also recommend eating here for the people watching alone, and the great view of the city skyline. 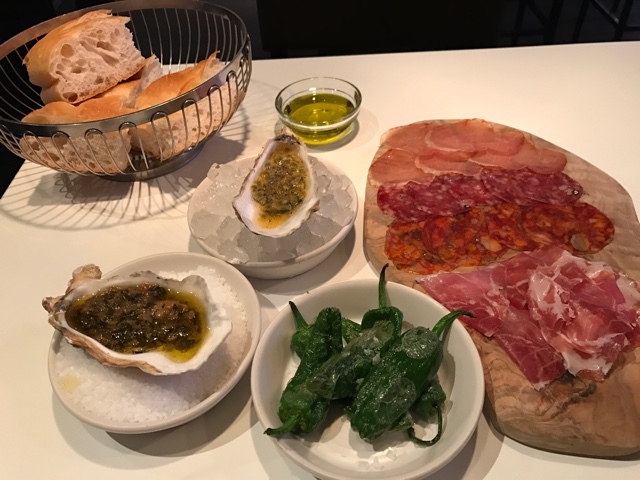 Restaurant Ayla serves up a mix of Mediterranean flavours in small tapas bites. 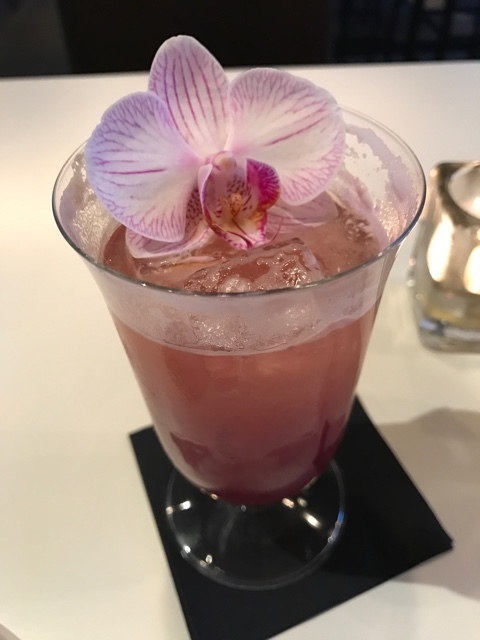 Everything from the cocktails to the oysters are quite delicious. If you are feeling adventurous I recommend going with the “Ayla’s Menu” option which is similar to a chefs menu. The kitchen will put together the best food pairings for you for a nice surprise of a meal. However if you do go with that option I recommend wearing stretchy pants as you will be eating a LOT of food. My favourite was the passionfruit raw oyster and I’m not even a big oyster fan but it was out of this world. There are of course tons of things to see and do in the city aside from just eat. 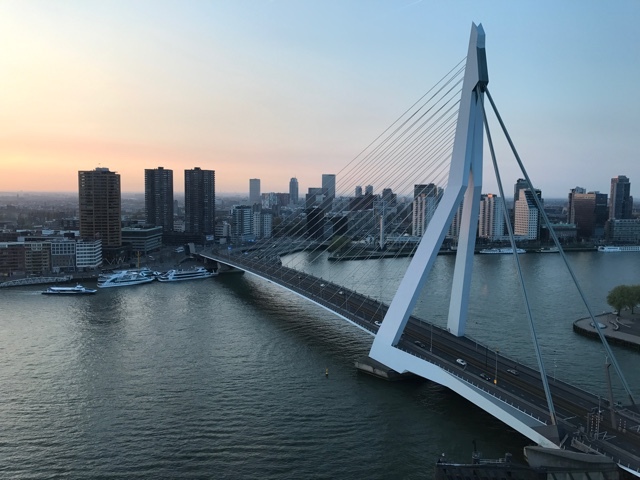 Here are some of my best recommendations of things to do in Rotterdam. To get around town the transit system of subways and street cars is great. It is also a very walkable city or easily bikeable if you want to rent a bike. Uber is always a popular option to get around as well. This suggestion also fits in nicely with the food recommendations, however the options here are quite endless. The Rotterdam Market Hall is a unique building which is an attraction to be seen itself. 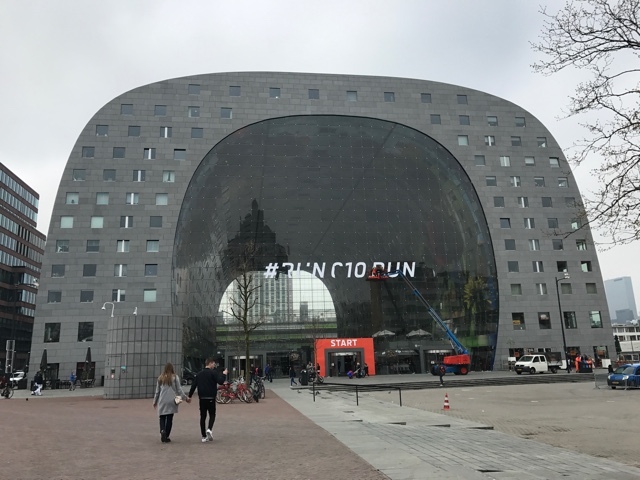 It is the largest indoor market hall in all of the Netherlands and the art work displayed on the inside of the arc is the largest piece of artwork in the country. The market hall has 100 fresh produce units, 15 food shops and 8 restaurants and is home to 228 apartments. Yes, you can actually live at the market. 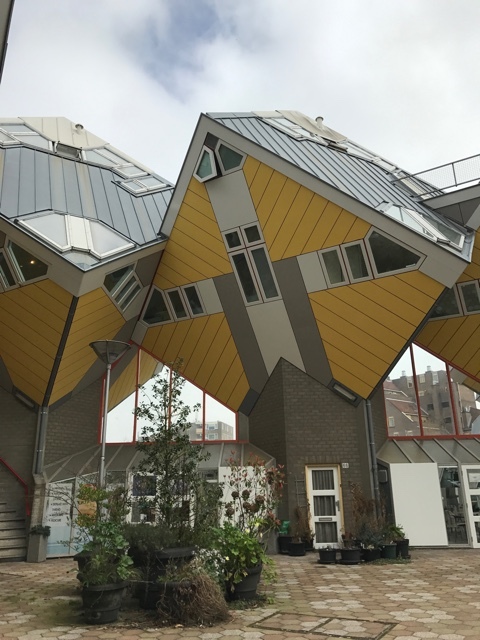 The Cube houses of Rotterdam are probably one of the most iconic images of the city. Built in 1977, 38 of these unique homes all attached together can be found in Rotterdam not far from the Markthal. Each house is a cube tilted at a 45degree angle, has 3 floors and a total area of 1,100 sq ft. 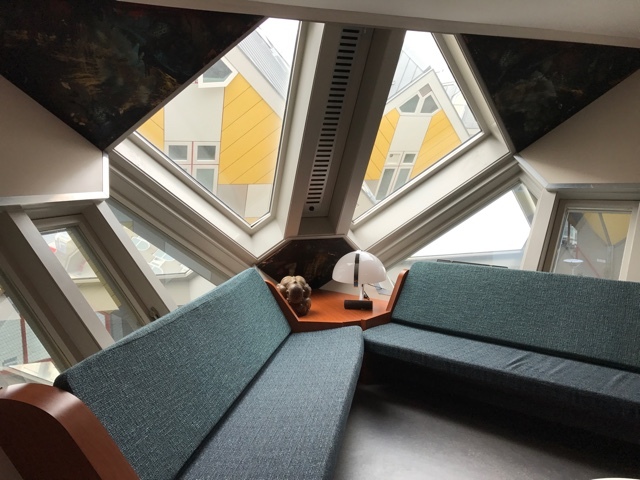 So many people are interested in them that one of the owners turned his property into a “show cube” so visitors can pay a small fee and tour one of the cubes. Definitely worth a visit. 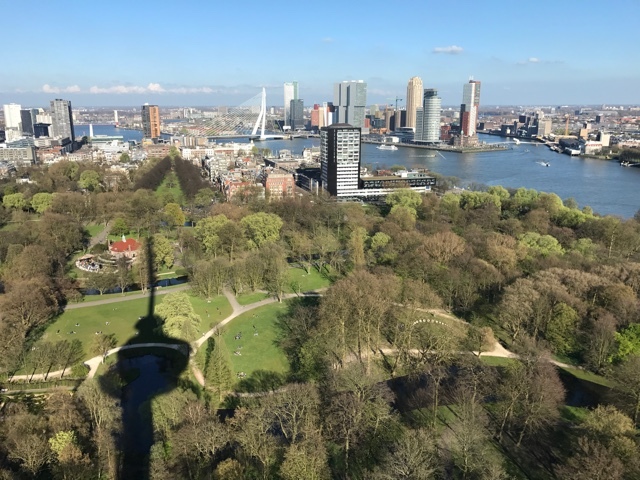 The Euromast Observation tower is a great place to visit for a great view of the city. Located 100 meters up the 185meter tall tower is a restaurant and observation deck with 360 degree views of the city. 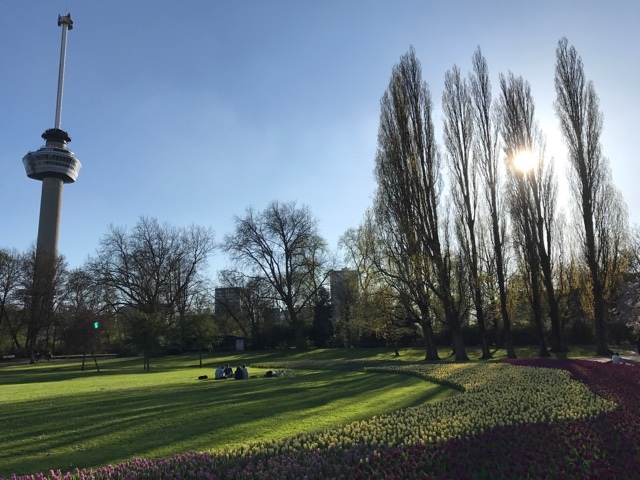 Located next to the tower is also a nice park called Het Park, perfect for a sunny day, picnic and to enjoy the gardens and tulips. 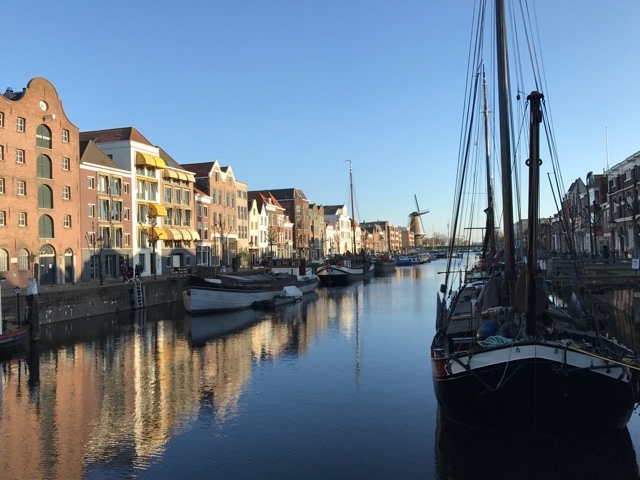 The historic Delfshaven neighbourhood is where you should go if you are in search of a windmill photo op. It is also popular for antique shopping or if you are wanting to visit a brewery or two. Basically the perfect neighbourhood to spend an afternoon wandering. The area dates back to at least the 1700s and the marina area is said to be where Pilgrim Fathers first sailed to America from. The canal area is also full of great photo ops of old boats and unique architecture. 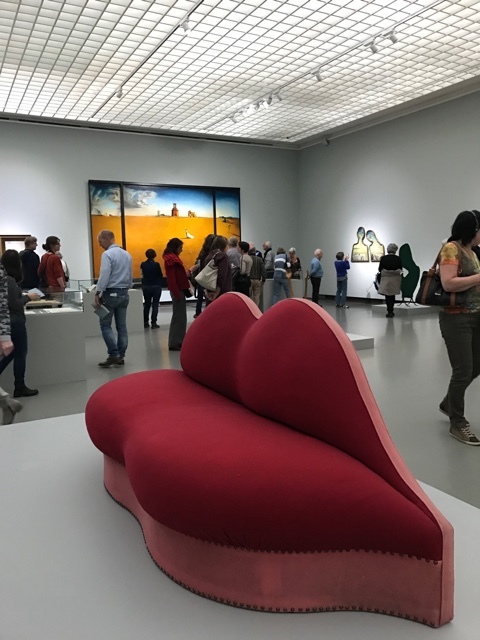 Museum Boijmans is home to paintings, sculpture and objects dating back to the early middle ages. This includes work by Dali, Rembrandt and Van Gogh as well as many other works by Dutch and European artists. 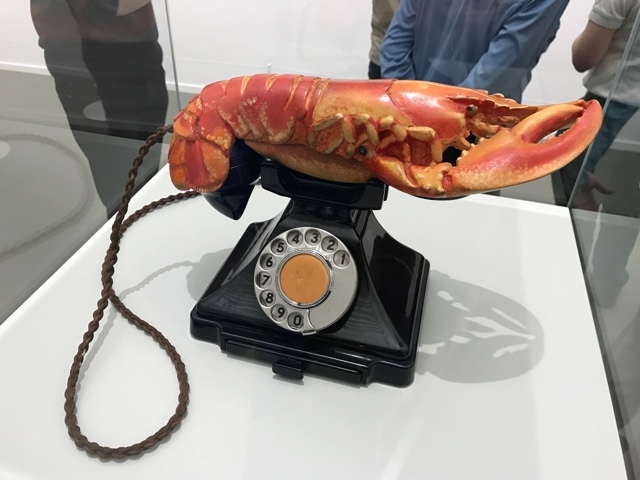 When I visited there was a touring exhibition called “Mad About Surrealism” featuring Dali’s “Lobster Telephone” which was definitely my favourite piece. If you have the time I also suggest checking out the nearby Kunsthal Museum which features constantly changing exhibits. 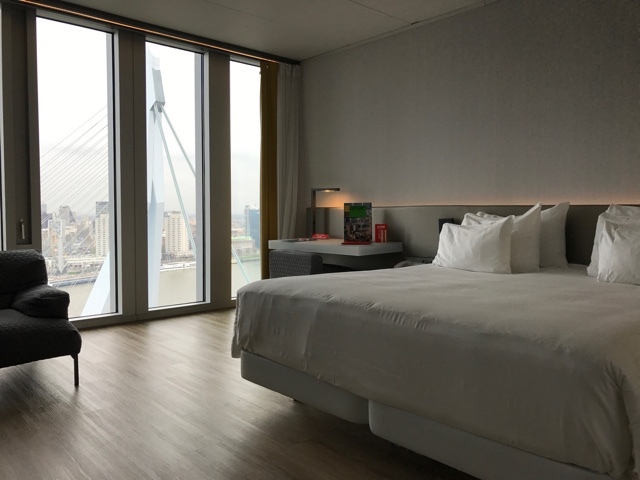 While in Rotterdam I stayed at the Nhow Rotterdam Hotel. Located in a funky building called De Rotterdam that really stands out on the city skyline. The hotel is close to public transit and is also very walkable to many top attractions. If you don’t get to stay then you must at least visit the Bar on the seventh floor. 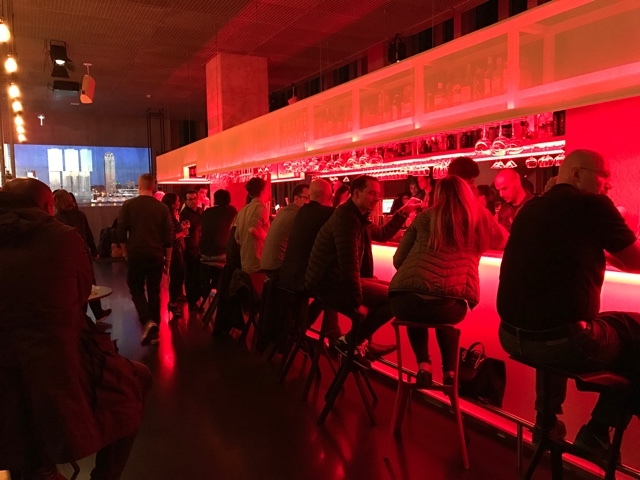 The bar features great food and drinks but also has some of the best sunset views of the city overlooking the iconic Erasmusbrug Bridge. 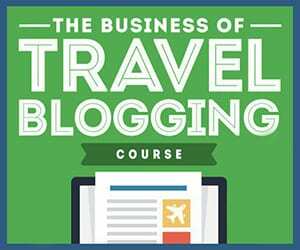 To book the Nhow hotel on Booking.com click HERE. I loved my time in Rotterdam and would definitely visit again in future. Have you ever been? Let me know what you loved about this city and what suggestions you have for visiting in the comments below. Use this image to pin this post for later! Thank you for sharing. Special thanks to the Rotterdam Partners for helping my with my trip. As always all opinions, and views expressed as well as tasty food eaten are my own. Next time take the Intercity Direct, it’s a high speed train between Amsterdam and Rotterdam. Takes you from Schiphol airport into Rotterdam Central in 25 minutes! Wow! 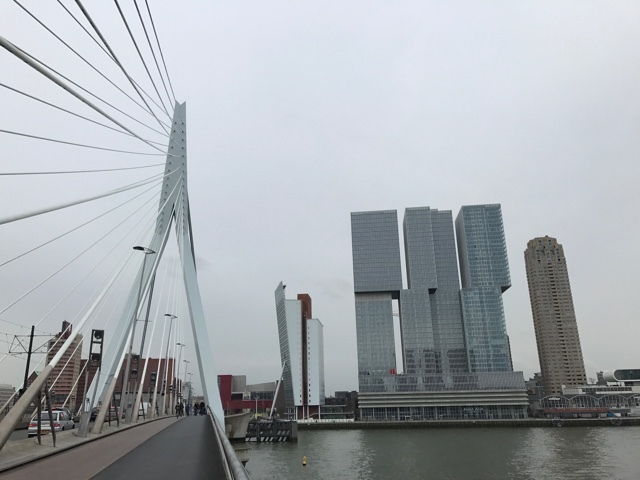 I never realized how modern Rotterdam would be. 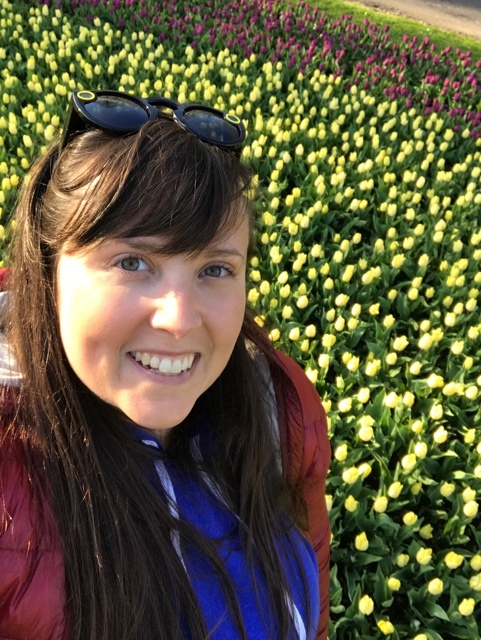 My girlfriend and I are actually planning a trip to Amsterdam and after seeing your photos I think that a day trip to Rotterdam needs to be done! The food also looks amazing, something I would expect in the Netherlands! Thanks for sharing Cailin! Definitely going to refer back to this when we’re in Amsterdam!